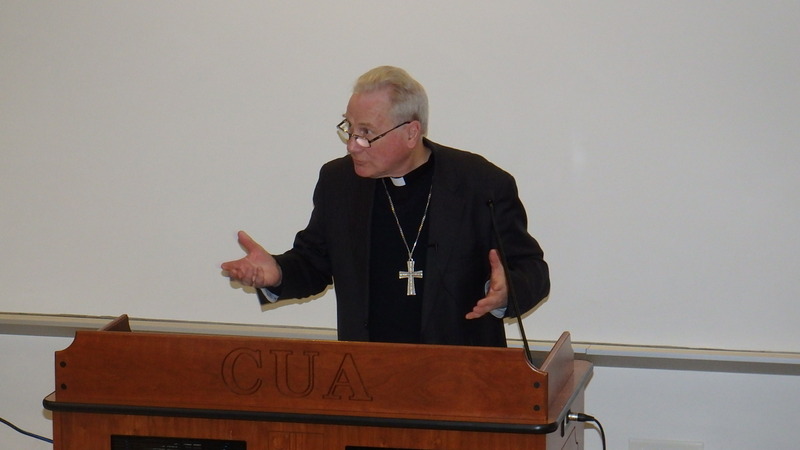 On Friday, March 6, 2015 at a lecture sponsored by Africa Faith & Justice Network (AFJN) and the Institute for Policy Research at Catholic University, Archbishop Michael Fitzgerald spoke on the Grounds for dialogue with Islam today. Archbishop Fitzgerald has been at the center of efforts to foster dialogue with Muslims. He served as Apostolic Nuncio to Egypt; is former President of the Pontifical Council for Interreligious Dialogue, and past Vatican Delegate to the Arab League. He emphasized the need to separate those committing atrocities in the name of Islam from those who genuinely strive to live out their faith commitment according to Islam and to educate people so as to address the reciprocal ignorance that prevails in faith communities. The lecture drew participants from the media, the diplomatic community, US Commission for International Religious Freedom, the Muslim community, and from the advocacy network in the Washington metro area. (a) The fundamental difference in the originating experience of Christianity and Islam. Both Jesus and Muhammad preached a message of conversion and gathered a group of disciples around them. While Jesus preached the Kingdom of God which was not of this world but designed to change the behavior of believers for a better life, Muhammad preached a message which was to bring about a renewal in the Arabia of his time. The new community (Umma) bound by religion, became at one and the same time a religious and a political community. (b) The attraction of the Caliphate. The lack of a clear successor at the death of the Prophet left a leadership void and the community divided with the result that each Imam is confirmed as the authentic guide of the community, as guardian and interpreter of the Holy Qur’an according to which the community is to live. Observing that groups such as the Takfiri Jihadists and Boko Haram do not represent true Muslims, one should not suppose that the majority of Muslims are in agreement with them, or presume that dialogue is now impossible, Archbishop Fitzgerald emphasized that Christians and Muslims have been living peacefully side by side in many areas of the world and that genuine dialogue can be carried out between Christians and Muslims at four levels: (1) the dialogue of lifecalls for harmonious living between people of different faiths “where people strive to live in an open and neighborly spirit, sharing their joys and sorrows, their human problems and preoccupations”, (2) the dialogue of action whereby harmonious living naturally leads to actions undertaken in common – working together for the common good, getting religious leaders to get to know one another and fostering cooperation, (3) the dialogue of discourse where specialists seek to deepen their understanding of their respective religious heritages, and to appreciate each other’s spiritual values and (4) the dialogue of spiritual experience that fosters sharing spiritual riches that are rooted in one’s own religious traditions such as prayer, contemplation, faith experience and ways of searching for God. In conclusion, Archbishop Fitzgerald reiterated that Christian-Muslim dialogue exists, that meetings of religious leaders take place frequently, and that leaders make statements together and act together when the occasion arises. He noted however that despite this growing cooperation, mutual suspicion has also grown, and this renders progress in dialogue more difficult. There is therefore a need to educate people and address the reciprocal ignorance that obtains between the communities. In this sense, interreligious dialogue should be engaged as a preventive medicine rather than a fire-brigade that can be called on to put out an inferno.